The Pyrenean Mastiff originated in Spain for use as a guard and defense dog against beasts of prey, mostly wolves and bear. In modern times he is used as a guard for country estates. 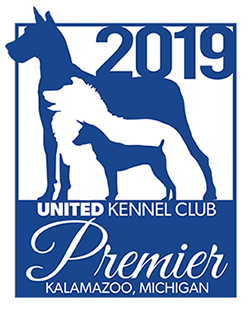 The Pyrenean Mastiff was recognized by the United Kennel Club July 1, 2006. 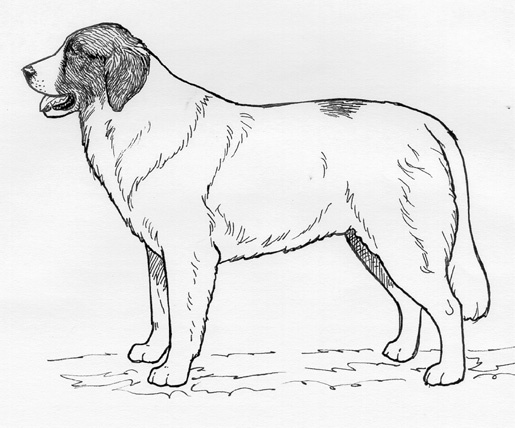 The Pyrenean Mastiff is a very large dog, with a harmonious build. He is strong and muscular, with firm bone structure. In spite of his size, he should never give the impression of being sluggish or heavy. Friendly, calm, noble and extremely intelligent, the Pyrenean Mastiff is courageous and never backs away from strangers. He is basically good natured with other dogs but will fight if antagonized. Large, strong and moderately long, with the skull slightly longer than the muzzle, and a gentle, but perceptible, stop. At least as broad as it is long, and slightly convex in profile, with a pronounced occipital bone. Slightly tapering from stop to tip, but never pointed. The bridge of the nose is straight. The upper lips cover the lower but without any looseness. The pigment of the lips and gums should be black. The Pyrenean Mastiff has a complete set of evenly spaced, white teeth meeting in a scissors bite. Faults: Level bite, slightly overshot bite, missing premolars. Disqualifications: Markedly overshot or undershot. Disqualification: Nose any color other than black. Small and almond shaped, hazel in color, the darker shades preferred. Eye rims are black. Expression is alert and noble but can be very stern when directed at an opponent. Medium sized, triangular in shape, set above the line of the eye. In repose, the ears hang close to the cheeks. When the dog is alert, the ears stand away from the cheeks. The ears should not be cropped. Broad, strong, muscular and flexible, with loose skin and a distinct double dewlap. The shoulder blades are long and sloping, and form an angle of approximately 100 degrees with the upper arm. Absolutely vertical, straight and parallel, with muscles and sinews clearly visible. The bone is sturdy, and the elbows are bony and fit closely to the chest. The pasterns are slightly sloping. In proportion, the Pyrenean Mastiff is just slightly longer than tall. The body is powerful and robust, yet supple and agile. The chest is broad and deep with a protruding forechest. The ribs are well sprung. The withers are well pronounced, and the back is straight and level, whether the dog is standing or moving. The loin is long, and narrows gradually towards the flanks. The croup is wide, long and sloping. The dog stands with its hipbones the same height as its withers. There is a moderate tuck-up. The angulation of the pelvis and femur is approximately 100 degrees. The thighs are long, strong and muscular, with good bone. Angulation at the stifle is approximately 120 degrees. Angulation at the hock joint is approximately 130 degrees. The rear pastern has a clearly defined Achilles tendon. There may be either single or double dewclaws. Cat feet, with the rear feet slightly more oval than the front feet. Set on medium high, thick at the base, hanging at least to the hocks. The last third of the tail is definitely curved. When the dog is alert, the tail is carried in saber form, with a hook at the end, but never curled completely over the back. The coat on the tail forms a soft, beautiful plume. Dense, thick and moderate in length, bristly, not wooly, in texture. Medium length coat, measured along the middle of the topline, is between 2 to 3 inches in length. The coat is longer on the shoulders, neck, belly, backs of legs and tail. On the tail the coat is softer in texture. The skin is elastic and thick, pink in color with pigmented patches. The mucous membranes are all black. Disqualification: Lack of black pigment in any mucous membranes. Coat in the middle of the topline that is shorter than 1.5 inches or longer than 5 inches. Basically white, with a well defined mask, and sometimes irregularly distributed, clearly outlined patches of body color that match the mask. The most desirable color is snow white ground color with patches of medium grey, intensive golden yellow, brown, black, grey-silver, light beige, sandy or marbled. Undesirable are a yellow-white base coat and/or red patches. The mask should be clearly defined. The ears are always spotted. The tip of the tail and the lower parts of the legs are always white. Tri-color or pure white dogs without markings are undesirable. Disqualification: Any color or combination of colors not clearly defined in the standard. Males should be at least 32 inches at the withers; females at least 29.5 inches. There is no upper height limit. The lowest allowable limits are 30 inches for males, and 28 inches for females. When quality is equal, the bigger dog is always preferred. At a trot the gait is harmonious, strong and elegant, and there is no tendency for the legs to swing outward or for the dog to pace. Lack of black pigment in any mucous membranes. Coat in the middle of the topline that is shorter than 1.5 inches or longer than 5 inches. Any color or combination of colors not clearly defined in the standard.